Tent and Place Cards are an excellent and economic way of conveying information in a variety of sales and marketing situations. We design, print and tape various sizes and orientation of tent cards depending on the application. 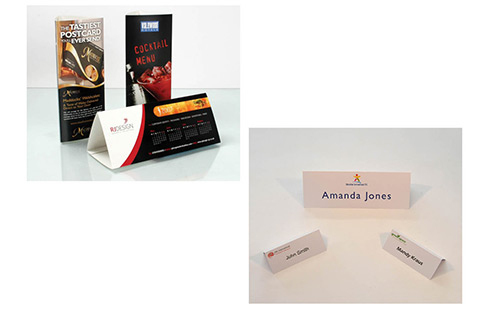 We can print place cards - in colour or black – from a simple Excel spreadsheet. FAST – We can design, print and tape tent cards in 2-3 days and place cards in a few hours. LOCAL – If required we can visit your office – at short notice – to discuss your requirement. Free local delivery is part of our service - or you can collect from our centre in Clarence Street. We have a car park for customers’ use behind the centre.